mfr: Amcor, Inc. 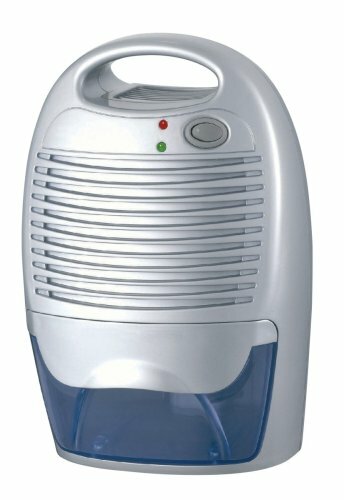 This dehumidifer uses peltier technology which offers almost silent operation, no compressor, no refrigeration, no noise orvibration - ideal for closets, small bedrooms, under sinks, shoe closets, wardrobes etc.
? Ideal for closets, pantries, under sinks, small bedrooms, shoe closets, wardrobes etc. Easy to remove water tank with tank full warning light and auto cut off. Max capacity 800ml. Easy to remove washable air filter. This item was so inexpensive that I purchased two. One is working quite well, and I am happy with it. The other did not work for 24 hours. I plugged it in Friday night, and it was dead on Saturday morning. I'm glad that I had two so that I could switch and see which part of the unit was dead (the console or the wiring). The console was the defunct part. Now I have to go though the hell of returning to Amazon. I bought this from Amazon on August 9, 2007. It worked fine at first. I emptied it about once a week and it was almost full. However this last week, I emptied it as usual, and when I plugged it back in and tried to turn it on, nothing happened. I have called Amcor and they promised to get back to me in 24 hours. That was almost a week ago. If they do get back to me I will post again about what they said/did. I guess I will have to just get one of those big, real dehumidifiers from the hardware store. Too bad, this is just the right size for what I need. Oct. 15, 2007. No word from AMCOR in reply to my phone call. I emailed them today and received a reply. I have to give them my credit card information so they can charge me for shipping! I have to pay to ship my non-working unit and also for them to ship me a replacement! From AUSTRALIA!!! Oct 16, 2007. After not working all last week, I tried it several days in a row... it now is working again. When it first came on it made a rattling noise for a few moments, then became quiet again. It is working, but NOW when the AC adaptor is plugged in, the radio in the same room makes a high whining noise. It didn't before. also, the last time I emptied it, the red light was on, and it had turned off due to being full. Okay it worked well for the last couple of weeks. I emptied it before it got full and it started up when I plugged it in again. However, last night, I looked in at it, and it had stopped. It was less than half full, so it should not have turned itself off. The adaptor still had a green light on. I emptied it again and plugged in, tried to turn on. No response. A few days ago I thought it was making a louder sound than before, sort of a huffing sound. Also this unit and the adaptor both get quite warm when in use. maybe it will start up again. One email I got from Amcor about it said that it is "clearly written in the Warranty, that shipping to and from the factory is paid by the customer"
Yes, but it is also a YEAR Warranty. and this worked for two months, then a week break, then for two weeks. and now?